Pour the milk into the bowl. 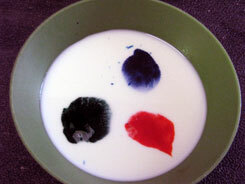 Be careful not to move the bowl, you want the milk as still as possible, then put one drop of each color in different places in the milk. 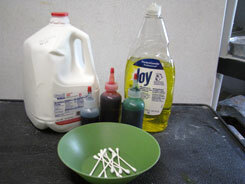 Milk has fat in it and the food coloring floats on top of the fat. The fat is all connected with bonds. Think of it like the little pieces of fat all holding hands with each other. Dish soaps are used on greasy or oily dishes because it breaks the bonds in fats allowing them to separate. 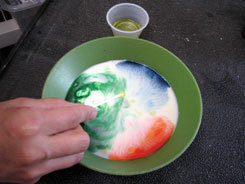 When you add the dish soap to the milk, the fat separates and moves making your colors explode!